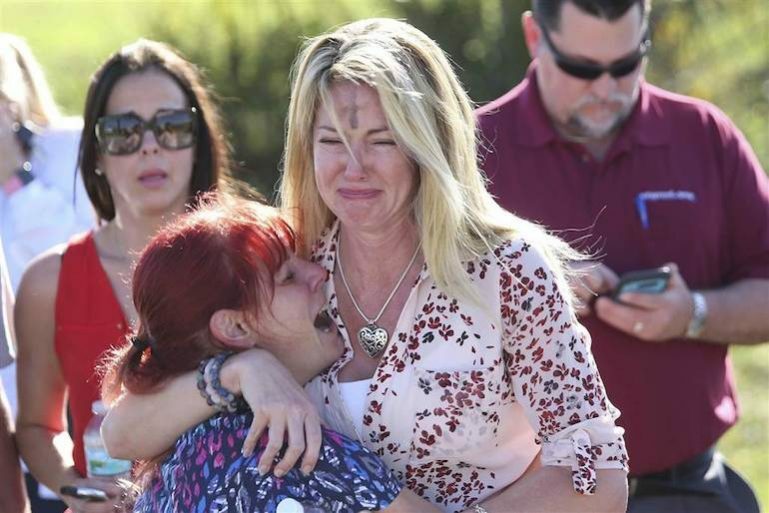 17 people were killed in a shooting at a at a high school in Parkland, Florida,USA. A former student, 19-year-old Nikolas Cruz, entered equipped with a gas mask, smoke grenades and multiple magazines of ammunition, opened fire with a semi-automatic weapon, killing 17 people . Charges followed hours of questioning by state and federal authorities around the deadliest shooting at an American high school. Some of the victims are now heroes of Marjory Stoneman Douglas High School. Assistant coach Aaron Feis, threw himself in front of students; "He died a hero and he will forever be in our hearts and memories," tweeted the school. Feis graduated from the school in 1999 and worked mainly with the junior varsity team. He lived in nearby Coral Springs with his wife and daughter, and spent his entire coaching career at Marjory Stoneman Douglas. Chris Hixon, a 49-year-old married father of two, was also among those killed, the Archdiocese of Miami confirmed Thursday. It was in that security role that Hixon apparently came within range of the shooter. "He loved his family, he loved his job," Sanzari said. "Chris was just amazing." Students said geography teacher Scott Beigel, 35, helped them enter a locked classroom to avoid the gunman and paid for the brave act with his life. Thirteen wounded survivors were still hospitalized, including two in critical condition. His Holiness Pope Francis was deeply saddened to learn of the tragic shooting that took place at Marjory Stoneman Douglas High School in Parkland. Assuring all those affected by this devastating attack of his spiritual closeness, he prays that Almighty God may grant eternal rest to the dead and healing and consolation to the wounded and those who grieve. With the hope that such senseless acts of violence may cease, Pope Francis invokes upon all of you the divine blessings of peace and strength. 2. Scott Beigel - Scott was a 35-year-old geography teacher at the school. 14. Alex Schachter - a member of the of high school's marching band.